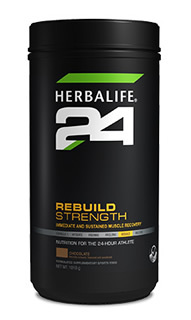 Herbalife24 is designed based on the latest science. Whether you're a gentle jogger, gym lover or an elite athlete Herbalife24 has products to help you prepare, train and recover. Take training, performance and recovery to the next level with our 24-hour sports nutrition line. This is a sustained muscle-building shake that delivers whey and casein protein to help rebuild fatigued muscle. For use after aerobic exercise. Contains 25g of protein that contributes to the growth and maintenance of lean muscle mass, delivering protein to fatigued muscle. Contributes to the growth of muscle mass. Milk protein isolate, whey protein concentrate, fructose, sugar, maltodextrin, whey protein isolate, cocoa powder, acidity regulator (potassium citrate), salt, high oleic sunflower oil, medium chain triglycerides, anticaking agent (silicon dioxide), natural flavouring, magnesium dioxide, milk masker, thickener (gaur gum), sweetener (steviol glycosides), magnesium citrate, ascorbic acid, DL-alpha tocopheryl acetate, ferrous fumarate, D-calcium pantothenate, thiamine, mononitrate, chromium chloride and pyridoxine hydrochloride.